The periods immediately before and after childbirth have a place of special importance in the customs of the Turks. By tradition, these preparations began during the sixth or seventh month of pregnancy. A midwife living in the vicinity would be selected and engaged by sending her an okka (a unit of weight equal to about 1.28 kgs) each of sugar, coffee beans, and soap in three embroidered leather pouches. After a birth, pitchers of a specially-prepared sherbet would be sent out to relatives, close family friends, and neighbors to announce the good news. If the baby was a boy, the neck of the pitcher would be tied with a red ribbon; if it was a girl, the mouth of the pitcher was tied with a red-dyed cotton gauze. In the days that followed, guest coming to offer their congratulations would be served sherbet in cups set in silver holders. In the most spacious bedroom of the newborn baby's house, the childbed was set up on a bedstead or with about six or seven mattresses set on the floor. 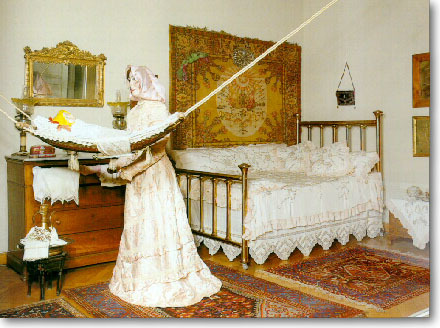 The childbed was covered with a quilt of satin or velvet with matching pillows and cushions set at the head and along the sides. 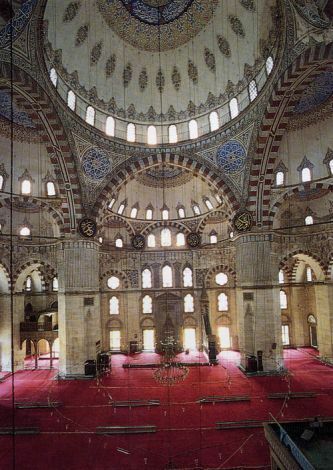 These coverings were all heavily embroidered with silk or metal braid in a raised satin stitch called anavata. A copy of the Qu'ran in a pouch was invariably set by the bed and a silver mirror (symbolizing a brilliant life) would be suspended somewhere nearby. A head of garlic pierced on a skewer would be wrapped up in red gauze and evil-eye beads would be attached to it. This garlic would be crushed onto the threshold of the childbed room when the new mother went to the baths on the fortieth day after birth in the belief that it would keep pain and suffering away from the house. The childbed would be dismantled on the seventh day of confinement. On that day, the local imam or the head of the family (usually the oldest man) would whisper the Call to Prayer (ezan) and Confession of Faith into the child's right ear. He would then repeat the baby's name three times into its left ear and also recite the Besmele. The fortieth day after the birth of a child was the occasion for the mother and infant's excursion to the local public bath accompanied by friends, neighbors, and relatives.